No need to remove your altimeter from your rocket to obtain flight data, with this latest micro size altimeter device from Jolly Logic. 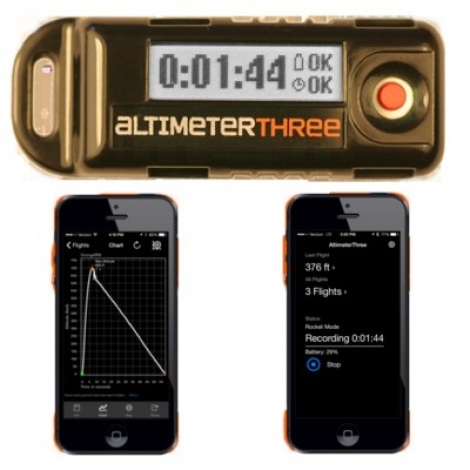 The Altimeter 3 enables you to control your device from an Android or Apple phone using Bluetooth technology. Once your phone has the Altimeter 3 app. installed and is Bluetooth - paired with your phone, detailed information of your flight in 0.05 second increments, can be downloaded to your phone for further analysis. Simply install the Altimeter 3 in your rocket, and press "Record" from your phone app. Flight data will be downloaded to your phone from the time you begin to record. Battery condition can also be determined form your hand-held device. Flights up to 9,000m may be recorded.